We're delighted that True Believers 2018 will again see a great selection of tables featuring traders selling Comics, Toys, Collectibles and more. Below you will find a full list of the Traders who will be joining us for our 4th event. If you haven't bought your tickets yet, please head to our Ticket Page now to buy yours. COMIC CONNECTIONS - Oxfordshire's longest running comic-book store, with all the newest and best American comics, toys, games, and much more. FIRST UP COMICS - A long time fan bringing old and not so old comics, some to collect some just to read and enjoy. Will have a number of complete story sets from Vertigo as well as some good old DC and Marvel favourites. G-MAN COMICS - I have been a long time comic collector who, suddenly ran out of storage space. Time for some of them to reluctantly go. JP COVERS - Greetings Music Lovers, I will be selling my comic cover art done by my own fair hand along with marvel and DC comics all at knock down prices, bargains much cheapness! JS COMICS - I'm Jon, I've been collecting comics since I was a boy. I have comics mainly from 80's to current to sell all bagged and boarded. Along with the comics i'll be bringing some marvel universe action figures. NEAL CLUTTERBUCK - Regular, comic enthusiast. PROUD LION COMICS - Proud Lion is the name of two shops in Cheltenham - Gloucestershire's premier comic shop and Proud Lion Gaming, a friendly local gaming centre. Both shops are owned and operated by PL Horizons Ltd. Proud Lion was founded by Ben Fardon (Managing Director) in 2008. Ben has been a comic collector since he was young, with his early interests including Iron Man, Transformers, Batman Knightfall and Claremont & Lee's X-Men. After working in comic book retail for several years, he decided it was time to open his own shop in the heart of Cheltenham. Proud Lion celebrated its grand opening on Free Comic Book Day in 2008, and has been a hub for fans of both mainstream and indie comics ever since. In recent years, Proud Lion has grown to become a family business, with Ben's partner Rae Hurley coming on board to expand gaming in the shop. She fell in love with board games with the discovery of Small World, and has been an avid gamer ever since. Now she regularly runs demo days, open play nights, RPG sessions, and tournaments to encourage other gamers to share her obsession. In 2017, Proud Lion split into two stores - a comic shop and a friendly local gaming centre. Ben has continued to manage the comic shop, with Rae stepping into the new role as manager and host at the FLGC. PSYCHO COMICS - I specalise in high end and key issues and have a very large amount of back issues. RANDOMNESS THE SHOP - We are an independent comic shop based in Cornwall, we sell back issues of marvel, dc and independents, we also sell collectible figures, toys, manga and pin badges. RNG COMICS - Rob started buying comics when he was 8 years old. The first comics that really interested him were the Jim Starlin “Captain Marvel” issues and after collecting comics for over ten years Rob decided to start a business to sell them as well, which led to the creation of RNG Comics. He has been trading comics for around 30 years. Starting with UKCAC in the late eighties and early nineties, RNG regularly sells at Golden Orbit comic marts around the country and has visited many other large marts such as Bristol Comic Expo, and NICE. Anachronauticon is a part time crafting business run by Nik and specializes in Steampunk, Japanese and comic inspired crafts, and features home crafted bags, purses, and accessories. She also makes clothes for Asian Ball Jointed Dolls. It all began in 2004 with her first costume and her first convention in San Francisco. It was the start of several crafting addictions including sewing, quilting, beading, and much more. She began exhibiting in 2011 and shared tables with, as well as assisting Rob, & exhibiting solo at Kitacon, Amecon and Ayacon over the years. ROCKS COMICS - Fantastic comics at amazing prices! 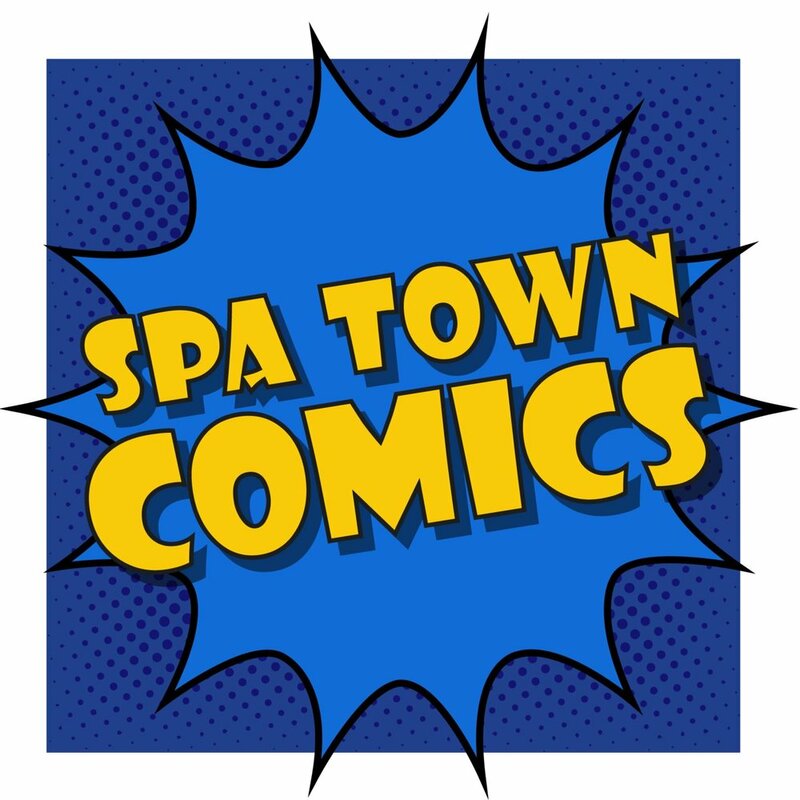 SPA TOWN COMICS - Spa Town Comics, brought to you by the award-winning Leam Comic Con team. We're more than just a comic shop as we promote comics, creativity & community. THE ENTHUSIAST - With over twenty years of selling comics to our discerning clientele, The Enthusiast returns to True Believers for our annual clearance of surplus stock, with titles from most popular publishers at 60p each or less. Your only chance in 2018 to browse and buy from this assortment. THINGS FROM DIMENSION X - We are a regular at True Believers - Selling comics / loose action figures / The Titanic's Mummy / The Beasts of Karlstad (and hopefully my new work The George Roebuck Chronicles). FLUTTERBY - I'm Lynne and I've sewn since I was a child and now I hand make my own creations called Super Owls. I also make skirts, aprons, capes and hair accessories. MISSION COLLECTABLE - I sell minifigure prints, minifigures, key rings & plush toys. I sell vintage toys such as Star Wars, Transformers, Mask, Ghostbusters, Dr Who and old DC/Marvel comics. SCIENCE FICTION COLLECTABLES - We sell licensed toys, gifts and collectables, as well as the odd comic and graphic novel. We sell mugs, glassware, action figures, Funko and more. Based in Bridgend, South Wales, we can often be found at events throughout South Wales and the South West. SQUARE ORANGE GAMES - Gloucester based independent retailer of Board, Card and Tabletop Games. THE COLLECTABLE TOY COMPANY - We are a family run business in Cardiff Wales specialising in vintage/retro toys games and gaming we also sell modern toys from lego to Neca and hot toys. VIVA HATE - We're a Derby-based shop that sell film, comic, gaming and internet based merch. AUTHOR T N TRAYNOR - Hi, my name is Tracy and I am an author of YA fantasy. Book 1 & 2 are available to buy and book 3 should be out in Dec 2017 hopefully. BAKED FOR YOU - Hand baked flapjack and cakes. BLACKVEIL ENTERTAINMENT - Blackveil Entertainment is an up-and-coming production company, based in southwest England but with members from all over the world. Our major projects include Foreman - an unofficial multimedia reboot of Doctor Who - Iris and the Fabulous Ones - a three-volume comic book - and Space Opera, a Kirby-inspired adaptation of Wagner's Ring Cycle. At True Believers - as in previous years - we hope to chat about the projects, drum up support, and invite new people to join our endeavors! GEEKYCOOL - Fun and funky handmade jewellery made in a comic book / film theme. HEROES FOR HIRE - Mild mannered graphic designers by day, crime fighting super stationery creators by night. Heroes for Hire present a super selection of collectible hero inspired business cards, paying homage to the alter egos of your favourite superheroes, for just a few of your earth credits you too can be Tony Stark, Matt Murdock or Bruce Banner. I LOVE YOU I KNOW - I love I know is a small home business who specialise in making handmade geek jewellery from books, comics and magazines. We do occasionally make other crafts to sell like hand decorated plates. we have a great love for our work and for our source materials. We are new to the business but committed and driven and have sold well at local fetes. We look forward to selling at an event we have attended every year. LITTLE SHOPPE OF HOLDALLS - The Little Shoppe of Holdalls is a one-crazy-cat-lady operation bringing you handmade bags and gear in all sorts of geeky prints, from Star Wars to Firefly, Doctor Who to Pokemon, we've got it all! MARVELOUS MAN - Selling everything from Marvel and DC to Nintendo apparel right down to your cheeky Pokémon must haves! METAPHORIC MERCHANDISE - Author of speculative fiction, trader in books and general gifts. This is our third year at TBCF. MISSY'S CUPCAKE EMPORIUM - Missy's Cupcake Emporium is a homebased company selling cupcakes cakes and sweet treats, themed and delicious! PUNX JUNKWEAR - We make nerdy punk jackets and other accessories and jewellery, our jackets are all custom and designed to theme a certain character, film, tv show, etc. SCENTOPIA - Bathing beauty and relaxation products of a unique, quirky nature all Alice in Wonderland branded. Bath and shower gel, Room and fabric sprays, Quirky scented candles.